I don’t recall music being a central theme for many board games, but lately that trend is changing. 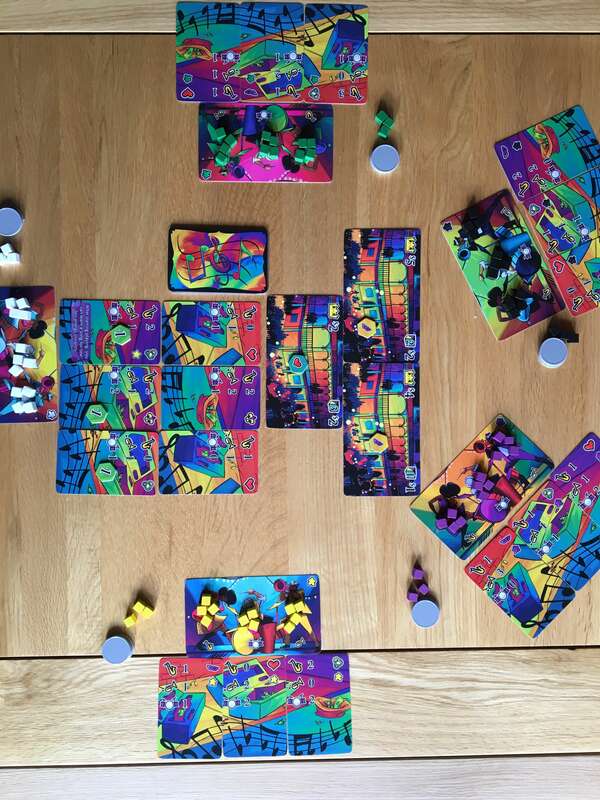 Last year we previewed Rap Godz from Board Game Brothas, whilst one of our featured reviews during 2019 will be Moaideas Symphony No. 9. In the meantime, however, we’ve got Big Easy Busking (which is live May14th on Kickstarter) to take a look at. Big Easy offers a novel take on the traditional area control game thanks to its musical theme, and producer Weird Giraffe Games has a reputation for very generous production values, ensuring that it should look a real treat when finalised. Big Easy Busking supports five players, each of who will represent a band of street performers somewhere in New Orleans. The artwork in my preview copy shows five identical bands, each of which feature three enthusiastic members. The artwork on the fifteen street cards is also identical, but the benefit for performing on each street (and the mood of the people there) is different, as indicated by various symbols. All of Big Easy‘s artwork is bright, colourful and energetic, with a real carnival atmosphere depicted throughout. Each member of the band begins with four energy cubes on them, whilst another three energy per player will be placed in reserve (for a total of fifteen energy per band.) The players will use this energy to learn and perform songs that are depicted on cards, which will then be used to impress the crowds in order to gather tips. Play unfolds in rounds, with the players taking turns to complete an action on their until they pass (which is usually when they either can’t (or don’t want to) spend any more energy. When all players have passed, a new round begins. As the game rounds unfold, new street locations will be added to increase the available choice of crowds to play to. It’s essential that players learn songs to suit the mood of the crowds they wish to play for, since playing a song that matches the current mood provides additional benefits when completed. There’s no real interaction or face to face gameplay in Big Easy, but it is certainly possible to intentionally disrupt the strategy of a rival band by attempting to muscle in on their patch. The gameplay in Big Easy is really quite straightforward to learn and teach, which means that the game plays out over about forty five minutes in most cases. Play time can certainly extend to an hour or so at higher player counts, but with limited setup between rounds, turns that flow nicely and a fairly straightforward objective (to make most money) there is little need for any holdup or complex decision making. Whilst I realise that my version is a preview copy and that the artwork will be subject to change, I find Big Easy to be a particularly attractive game that has a visual flow which ties in nicely to its gameplay. 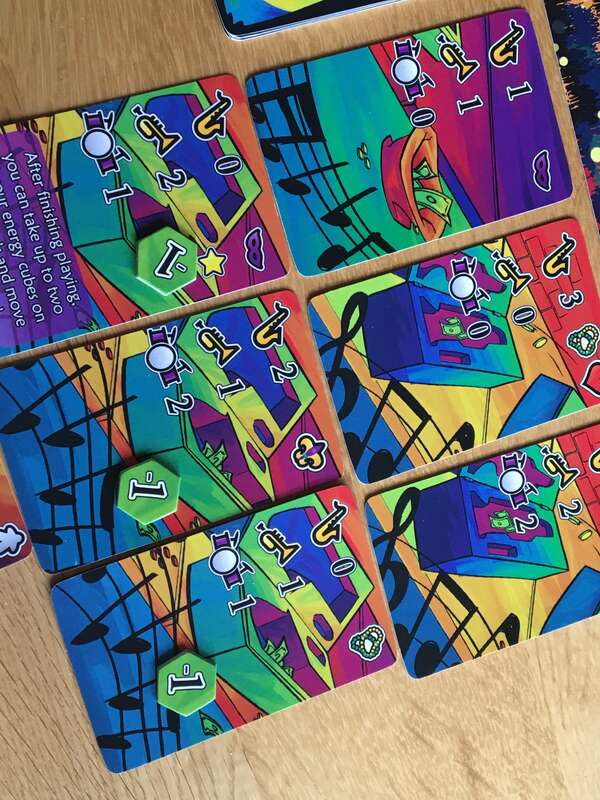 The starting song cards, for example, depict a stream of musical notes that link from one card to the next, as well as background artwork that spans across them. Other song cards come together in similar ways and there’s certainly a visual flow to Big Easy Busking that is reminiscent of the music that it seeks to represent. I also love that designer Josh Mills chose to use New Orleans’ incredible carnival scene as Big Easy’s setting. As always with preview games, I can’t be sure of what the finished version of the game will end up being like, but I can say that when I previewed Weird Giraffe Games last Kickstarter project (Fire in the Library) I ended up putting it into my Top 50 tabletop reviews to date. Whilst I think Big Easy is perhaps slightly less exciting than FiTL is, it has a very strong, unique theme that ties in exceptionally well with the energy and crowd pleasing mechanics that form the heart of the experience. Big Easy Busking should appeal to fans of fast paced area control games, especially if the musical theme also hits the spot. 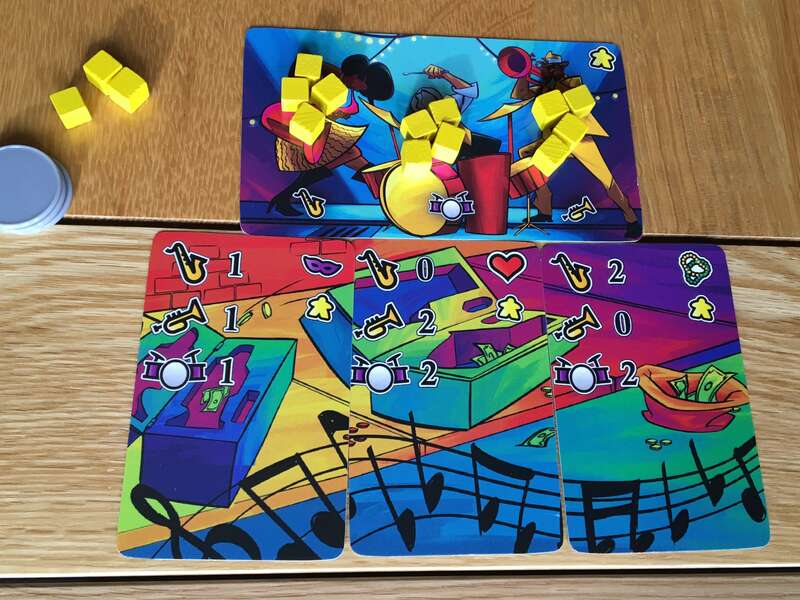 Big Easy Busking, at the time of this review, is due to appear Kickstarter on May14th. You can view it here.